This is a transcript of a podcast interview with Jennifer Johannesen @jenjohannesen conducted by Casey Quinlan @MightyCasey. Recorded at the Cochrane Colloquium 2018 . Listen to the podcast below. Ah! The trouble with patient and public involvement, also known as PPI. 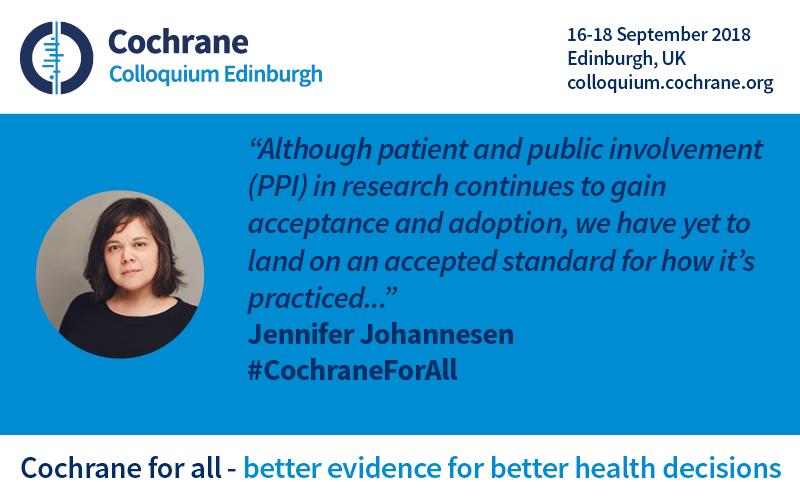 Well, I’ll clarify one thing, just as a bit of housekeeping and it’s that I’m going to be referring to PPI as patient engagement in my talk. That’s because, first of all, I’m Canadian and that’s how we refer to it in Canada. And also because I’m using a much more… a broader perspective on the idea of involving patients in research and service design, in organizational support, things like that. So the broad label of patient engagement is meanth to detach slightly from some of the programmatic approaches of PPI, specifically here in the UK. So I just wanted to clarify that so let’s rename it ‘The trouble with patient engagement’. Yes, that’s the ‘lost in translation’, as soon as you cross the border, there’s a phrase that could be different! So how do you see patient engagement or PPI moving from rhetoric to reality? I’m actually not on a mission to make patient engagement a reality or PPI a reality. I come from a more critical stance of patient engagement in general, where I wonder what the motivations are of the institutions that are enacting or implementing institutional programs to enroll patients. I suspect… the social sciences tell us that patient engagement often, as enacted by institutions, is designed in a sense to enroll patients in institutional agendas. And patients when they come to the table without agendas, which is kind of what patients and institutions want for some reason, is they think that patients are clean slates and that they come in and give their input and help the wheels turn in healthcare. I think when patients come to the table without agendas and without a reason to do so, other than simply happily contributing, they end up becoming almost ambassadors for the institutional agenda or what institutions want out of patients. So my goal in my session is to illuminate some of these concerns ,some of these issues. I don’t have a hat in the ring in terms of patient engagement. I don’t advocate for more of it. I don’t necessarily… It’s not my… it’s not my personal agenda to… I’m not here on behalf of patient engagement, or on behalf of science, or on behalf of research. None of that. I’ve noticed in my experience that things are maybe not quite as they seem and that patients are enrolled in activities that may or may not be supporting but I would think of as patient agendas. Largely because patients seem unclear about why they are participating in institution led patient engagement activities. So whether the dreaded box checking and co-opting outcome for patients, which I personally have seen in a number of patient engagement or patient inclusion projects over the years. Well, what I would also just say quickly is that the box checking itself in my mind is not necessarily the red flag. Because an institution or an organization or whatever, can create what people think of as meaningful dialogue and, you know, everyone’s having a say and then people are taking notes and nodding and all of that stuff. And people think that somehow that interaction has moved beyond the box checking and that constitute meaningfulness if people are assembled and having good conversations. Is there a specific outcome that you would like to see, as far people, whether we call them patients or people, having a say in the healthcare systems that serve them? Do you have an outcome checklist for yourself? What would that be? So my over-arching message in my plenary, which will be upcoming is essentially two things. One is that patients should resist participating in institution led patient engagement activities, unless they themselves know exactly what they’re there for and what it is they want to accomplish and are willing to hold the institution to account to show that those things that they’re there to demand are being worked on and done. I also have a message for researchers or a suggestion for researchers, are going to this in my talk. And it’s that to a large degree, patient engagement initiatives or the requirements for patient engagement that is handed down from on high is often very sweeping and blunt. Done in a way that, in certain circumstances, I think can compromise research. Compromise the speed at which it’s done and compromise the idea of what it is we think we’re doing when we do research. So I would encourage researchers to not necessarily hop on the bandwagon immediately, just because they’re told this is the new way of doing things. That there ought to be a considered measure dialogue amongst researchers about how they want to respond in certain situations and in some cases should say no or should protest loudly about this requirement being handed to them if they don’t see that the research will be meaningfully contributed to by having patience at the table. My critique is aimed primarily at institutions and organizations that organize these types of enrollment activities on their own behalf. And where patients think that they’re somehow contributing to something of their own value. This does not necessarily include patient-led grassroots movements or participatory research movements, where patients are self-organizing and determining for themselves what their priorities are separate from the institutional agenda. And there’s no issue in my mind about coming together and negotiating or working with organizations, if patients know clearly what it is they want.